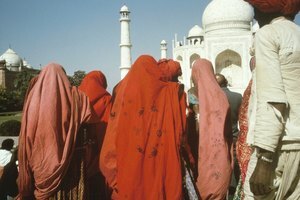 Are Muslim Women Supposed to Pray? What Is Iqama in Islam? During salat, Muslims face Mecca. When the muezzin, a kind of Islamic public crier, calls Muslims to pray, he does it in two steps: The adhan is the first step and is the actual call to prayer and acts as a reminder for those outside to go into the mosque to pray. The iqama is the second stage, marking the beginning of prayer, and is typically given more swiftly as it addresses those who are already in the mosque. The iqama takes place five times a day, once for each call to prayer. When the call to prayer goes out, Muslims gather at a mosque. In some cases, they stay where they are or find a private space to pray in. 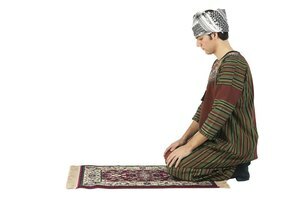 This type of prayer is called salah -- the plural term is salat -- and must be preceded by ablutions, or washing. Muslims perform a brief ritual washing or, if they do not have access to water, they use sand to symbolically cleanse themselves. 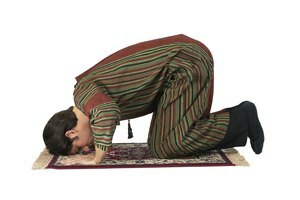 The prayer then takes place in a clean place, preferably upon a prayer rug. The first part of the call to prayer is the actual summons. In "A Muslim Primer," Ira G. Zepp, Jr. presents an English translation of the adhan. It repeats the phrases "God is most great," "I testify that there is no god except God," "I testify that Muhammad is the messenger of God," "Come to prayer," and "Come to success." The call goes out in a loud voice from a high spot, usually from the minaret of a mosque. Modern Muslims often use mechanical means to carry the voice even farther. While the adhan is the call to gather, the iqama is the call to start praying. Al-Homoud et al. define the iqama as: "(actual start time for performing prayer) which ... varies from one prayer to the other during the day." People reciting the iqama generally do so in a softer voice than they use for the adhan, according to Peace Vision's book "1000 Sunnah Per Day." Muslims stand shoulder to shoulder in rows inside the mosque during the iqama. 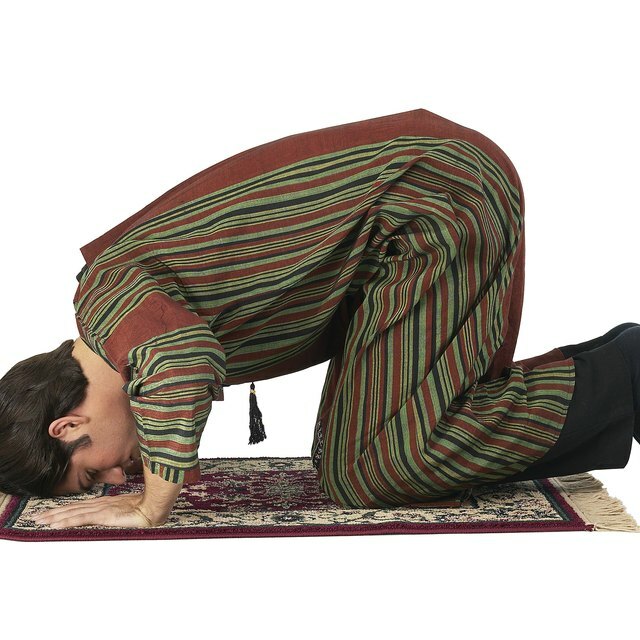 The subsequent salah involves different body positions and movements. The adhan and the iqama are recited at specific times of day, as laid out by Diane Morgan in "Essential Islam." The first time is at dawn, "when the sky starts to lighten." After the sun passes its peak and before "an object's shadow is twice as long as its height," the noon prayer is said. The mid-afternoon prayer can be conducted from that time "until an object's shadow is twice as long as its height" or until the sun goes down. Once the sunset is complete, the sunset prayer is said before "the red disappears from the sky." Immediately afterward, the nightfall prayer can be said any time before dawn reappears. All of these prayer times include the iqama. A Muslim Primer: Beginner's Guide to Islam: Ira G. Zepp, Jr.
Mosque Energy Perf ormance, Part II: Monitoring of Energy End Use in a Hot-Humid Climate: M. S. Al-Homoud et al. Marion Lougheed is a world citizen with a B.A. (Hons.) in social and cultural anthropology. She also holds a diploma in professional writing. She has visited or lived in more than 12 countries since the age of seven. 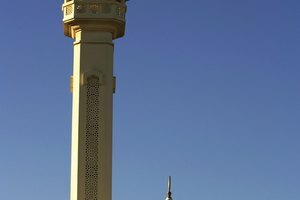 How Are the Five Pillars of Islam Used Today? What Is Involved in the Muslim Isha Prayer? Lougheed, Marion. "What Is Iqama in Islam?" Synonym, https://classroom.synonym.com/what-is-iqama-in-islam-12087497.html. 29 September 2017.